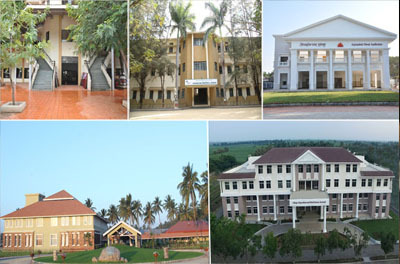 Krishi Vigyan Kendra (Farmers Science center), Baramati was established on 1st August 1992 under the affiliation ICAR. 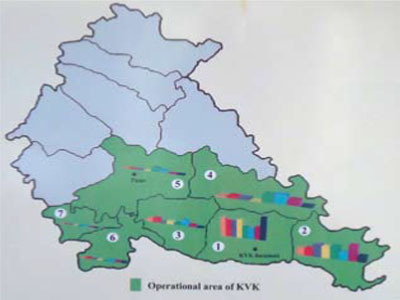 From 1992 to 2008, the operational area of KVK was whole Pune district, but after the establishment of new KVK in the Pune district, the operational area is reduced to the 7 tehsils of Pune district. Krishi Vigyan Kendra, Baramati is Model, Hi-tech & National Award winning KVK of India working for farming community since 24 years for the development of sustainable agriculture. The aim of Krishi Vigyan Kendra is to reduce the time lag between the technology transfer from research institutions to the farmers field for increasing production, productivity and income from the agriculture and allied sectors on a sustained basis. The vision of the KVK is: To be the leading resource and knowledge centre of Agricultural technology for the upliftment of the farming community. The Mission is : To deliver demand driven agricultural products and services by qualified professionals. 1. To plan and conduct survey of the operational area through Participatory Rural Appraisal (PRA) methods and characterize physical and human resources with special reference to identifying the technological and training needs of the farming community. 2. To compile all relevant recommendations/ packages of practices for the district to be meaningfully utilized in the training programmes and the follow up extension activities. 3. To plan and conduct production oriented and need-based short and long duration training courses both on the campus as well as in the villages for various target groups with priority on the resource poor sections. 4. To Organize Farm Science Clubs in order to inculcate in the younger generations a specific temper and an interest on agriculture and allied sciences and for scientific farming through supervised individual and group projects. 6. To provide practical training facilities of the Kendra to the teachers and the students of vocational agriculture of the higher secondary schools. 8. To implement all such schemes of the ICAR and other related organizations which intend to strengthen the training and technology dissemination programmes as well as follow-up extension activities of the Kendra. 9. To undertake on-farm testing of the technologies developed by the National Agricultural Research Systems (NARS) in agriculture and allied fields for their suitability and identifying constrains. 10. To demonstrate the potentialities of various technologies recommend for adoption in to maximize yield per unit time and area under different resource conditions. •	In addition, in order to speed up the process of dissemination of technology, a large number of various extension activities and production of seeds and planting materials, livestock, poultry and fisheries breeds and various bio-products are taken up by the KVKs.